On this voluntary teaching project you will work at a primary school in a poor township of Cape Town. These schools are located within underprivileged communities. This section of society has been largely overlooked by NGOs since the transition from Apartheid to Democracy. How can volunteer teachers help in South Africa? Running training clinics for Projects Abroad volunteers working with other schools (optional). You will be expected to work from 9am to 2.30pm, Monday to Friday. It is also possible for you to introduce extracurricular activities such as music and sport if you wish. These would normally take place after school. This project runs all year round so you can join at any time. Alternative classes are arranged for volunteers to teach during school holidays. You decide how much time you can spare and we will help you get the most out of it. You will gain experience of teaching English in a challenging environment. You will need to be creative and come up with new ways of communicating with pupils. You will also be able to learn from local staff who have experience of teaching in the townships. 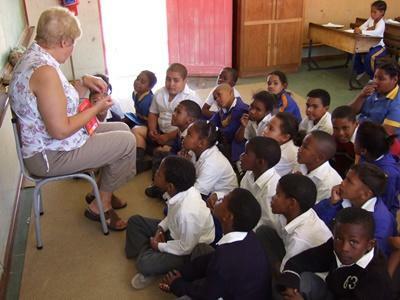 Through educating the young children at the school, you will learn about South African culture and way of life. Staff and pupils will want to hear about your life back home and your family and friends. We call this ‘cultural exchange’ and we think it helps our volunteers gain a new perspective on life. If you are interested in this project but don’t have the relevant experience, then please read about our regular Teaching projects in South Africa.